Unwind and rejuvenate your skin with our customized signature facial treatment specifically created just for you. 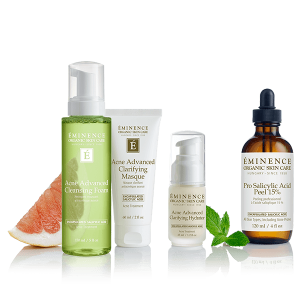 Our estheticians will choose from an array of organic ingredients of luscious fruits, vegetables, plants and herbs handcrafted by eminence organic skincare. Our award winning skin care products have an incredibly fresh aroma and will infuse your skin with natural pure vitamins to address a variety of skin concerns such as premature aging, sun damage, blemishes, sensitivity, loss of vitality, tone and radiance. Helps with ingrown hair, razor burn, sensitive, rosacea. The most common skin complaint among men. Shaving poses different issues for men causing all different kinds of irritation to the skin on a daily basis. This facial is specifically meant to sooth irritated skin and reduce breakouts caused from shaving. As well as having better skin you will learn how to treat your symptoms at home so your shaving problems will not re-occur. The Experience that can guaranteed results in 28 days! We have the facial solution for your Acne! The series includes a 30 minute facial at the spa once a week, for 4 weeks. In this facial you’ll receive the 15% Salicylic Peel, layered & timed differently each week. You will also receive a full sized retail product of each Cleanser, Mask and Hydrator to use at home. With a commitment to using the products at home day and night, combined with weekly facials – results are amazing! Click here for more details on products! For fine lip lines, dry, chapped, and irritated lips. Erase dryness and treat your lips to a naturally effective refining treatment to deeply hydrate and stimulate collagen production in your lips. 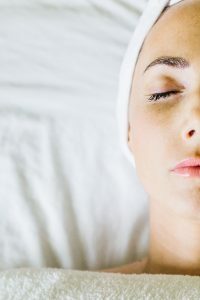 These experiences are designed & completed by our Head Estheticians, and are developed to target your skincare concerns, giving you a answer to your skincare questions and solution to your needs! You’re guaranteed to see results in one of these experiences! Sensitive, Firm, Age Corrective facials using products & techniques formulated to calm & soothe, and tighten skin so it appears lifted & firm. Clear for clients with hormonal or acne breakouts or Bright for treating uneven, hyper pigmentation or less vibrant skin. Home use Eminence skincare products targeted for your personal skincare solution are included in the experience price. A complete customized solution targeted for your skincare concern.